Needing her wisdom teeth removed, Amanda first came to Dr. Frankel’s office two years ago. Immediately upon walking into the Talmadge Road office, she loved everything about it. From the girls up front to her hygienist, Jess, her entire experience was nothing short of amazing. Even two years later, every time she visits her Frankel Family, she feels extremely comfortable. Amanda is a 2009 graduate of Sylvania Northview High School. She attended the University of Toledo where she majored in psychology. She enjoys reading and traveling. Today, she works in a small office doing secretarial work as well as nannies for three young children. 10 year old Cimram and 7 year Siona are sisters who attend Maumee Valley Day School. Aside from school, they enjoy playing piano, field hockey, and basketball. But more importantly, these two love Dr. Frankel! Watch them in action as they sing our jingle! Not only is Charles Buckner part of the Frankel Family, he is a first generation techie. Born in Chattanooga, Tennessee, Charlie served our country as a member of the Airforce from 1954-1958, spending time in Japan, Germany, and Turkey. After his military duties were served, Charlie attended Trine University in Angola, Indiana on the Korean GI Bill. At Trine University he majored in Engineering because he knew that those jobs were in high demand. After receiving his degree, Charlie and his young family moved to the Baltimore, Maryland area. During the mid 1960s, Charlie worked on the Saturn Launch Vehicle, which helped propel the spaceships that were part of the Apollo Moon Program. Additionally, he worked for Control Data Computer Corporation which was a super computer firm that competed with IBM, Honeywell, and RCA during the 1960s and 1970s. While working for Control Data, Charlie helped engineer the first computerized reading machine. Charlie also worked for Westinghouse in Baltimore. After retiring, Charlie and his wife, who is an artist, moved to Denver, Colorado. Now, however, Charlie and his wife live in Toledo. They moved here to be closer to his daughter and their family. And we are glad he is here and a member of our Frankel Dentistry Family! As always we have the best patients! 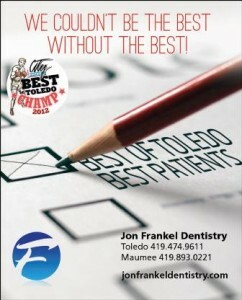 This year we are proud to announce that for the fourth consecutive year, we are recognized with the honor of being named Toledo’s Best Dentist. But we couldn’t have been named the best without you! 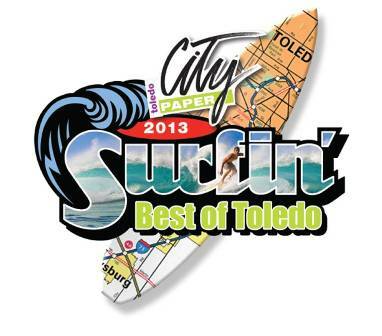 Thank you again, Toledo. We are happy to call this great community home!